You can listen to sample recordings of me reading aloud in English. My full name is Tomasz P. Szynalski, but you can call me Tom. I live in Wroclaw, Poland. I have earned a Master’s Degree in business administration at the Wroclaw University of Technology. Since 1998, I have worked mainly as an English-Polish translator, sometimes also as an English teacher, web designer and software developer. 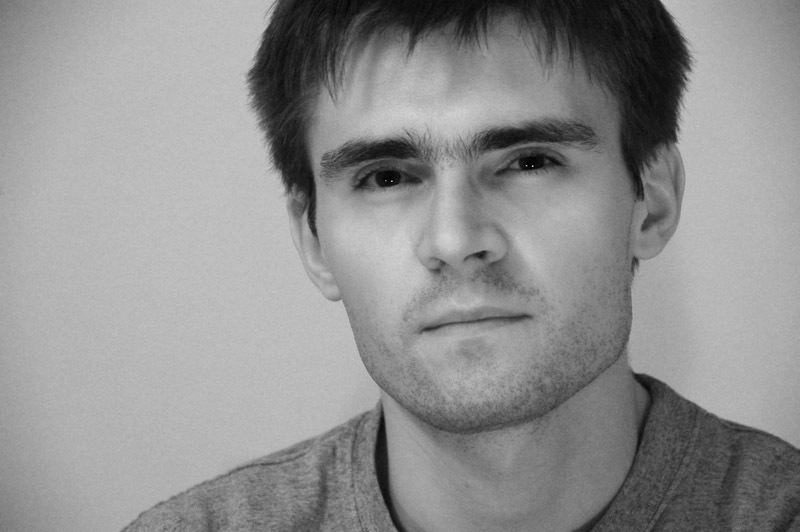 In 2000, I started this website, together with Michal Ryszard Wojcik. 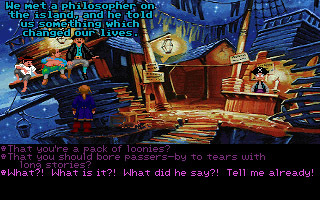 Adventure games like Monkey Island 2 were my only source of input in elementary school. I had to understand at least some English to progress in the game. Things got a little better because of... computer games. When my father finally bought me my first PC in 1991, I started playing lots of adventure games. I especially loved LucasArts games, such as Indiana Jones series, the Monkey Island series, and Day of the Tentacle . While playing these games, I would read a lot of English sentences and after some time I gained a little “grammar intuition”. I first realized this when I took part in an English contest for elementary school students. As I looked at the grammar questions, I noticed that I could sometimes tell the right answer just because it sounded good and the other answers sounded bad to me. I also noticed that I could remember phrases from games that I had played. For example, when I looked at a question about the present perfect tense, I would remember a phrase with the present perfect tense that I had seen in a game. For the first time, I thought that maybe you don’t need a teacher to explain grammar to you; maybe you can just “absorb it” by reading in English. Was it possible that adventure games had taught me more than English classes? I would love to tell you that I started to learn English seriously because I wanted to improve myself, communicate with the world, or even get good grades and a well-paying job. In the beginning, my motivation was far more evil: it was my competitive spirit. In 1993, I got into the best high school in Wroclaw. It was a special program with a lot of English classes and certain classes (like math and physics) taught in English. I owe a lot to the people I met there, both students and teachers. My first two years in high school were very important for my English. At first, I thought I would do well without any serious effort. After all, I had gotten the highest score in class on the initial placement test and, until then, had been the top student in every English class that I had attended. But then I noticed that there were two other guys — Wojtek Dzierzanowski and Michal Ryszard Wojcik (who later became my partner at Antimoon) — who were quite impressive. Wojtek had great American pronunciation and Michal’s English seemed completely free of errors. What’s more, every time I heard them speak, they seemed to have a bigger vocabulary. I was not a friendly admirer of their progress. In fact, I hated what was happening. I hated the possibility that another student could be better at English than me. I had been attending English lessons since I was 6 years old, dammit, and I was not going to let someone get the upper hand on me. It was clear to me that I needed to put in some serious work, or else I would be left behind. 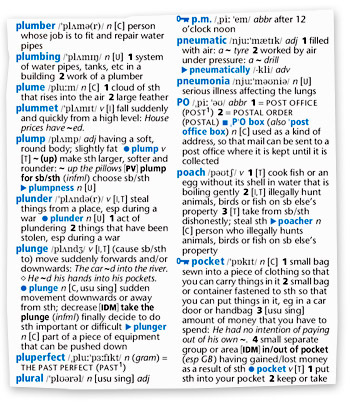 The Oxford Pocket Learner’s Dictionary — my first English-English dictionary. I began to pay more attention to the advice of my English teacher, Mr Janusz Laskosz. I bought a proper English-English dictionary and learned to read the phonetic transcriptions in it. At home, I started to practice pronouncing English words, taking care to capture the difference between similar words like full and fool. I was getting better and better at pronouncing English vowels like æ (the vowel in cat) and ə (the first sound in away, also known as schwa). Despite the fact that British pronunciation is the de facto standard in Polish schools, Wojtek, Michal and I all decided to study American pronunciation. It was fun to go against the grain and American English offered a better choice of interesting content, such as TV shows and movies. I started listening to recordings (such as the Shaggy Dog Stories that we got from Mr Laskosz) and imitating the phrases I would hear. Every day, after school, I watched American TV (e.g. CNN International, Cartoon Network). As a result, I was getting better and better at understanding spoken English. I was also picking up some words and phrases that I could use in my own sentences. Our high school was unusual in that it had a few American teachers. I decided to take advantage of this opportunity as much as I could. I would come up to them between classes and start conversations about everyday things. Sometimes, when there was poor discipline in class, I would spend the entire 45 minutes talking to the teacher, while my classmates talked to each other. When I spoke, I made sure to use simple grammar to avoid mistakes. After 2 or 3 months of this, I was no longer afraid to open my mouth. Sure, I often had problems finding the right word, I never used conditionals, the past perfect tense or as if clauses, and my writing skills were unacceptable (writing requires a much better vocabulary than speaking). But I could usually express my basic meaning with few mistakes and pretty good pronunciation, even if I sounded like a little kid. It was at this time that my motivations began to change. The feeling of competition was still there, but now I was also motivated because I was enjoying my own progress and the possibilities that it had opened for me. It is so much fun to pronounce a word just like an American, to use a newly learned phrase, or to watch TV in a foreign language and understand it! One of my most important moments in high school was when I overheard Wojtek and Michal talking about a computer program that they used to learn English words. The program was called SuperMemo. “I knew they had some sort of trick for memorizing vocabulary”, I thought. “That’s why they are always full of advanced words like appalled and streamline!” Naturally, I got very interested in their “secret weapon”. But my motivation was too small. If you wanted to use SuperMemo, you had to spend a lot of time copying words, phonetic transcriptions and example sentences from the dictionary into your computer. I gave the program a try, but I could never get down to using it seriously. 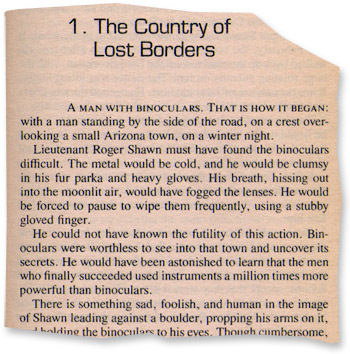 First page from The Andromeda Strain by Michael Crichton, one of the first books I read in English. During the summer vacation of 1994, I started reading books in English, mostly thrillers and sci-fi novels. This was largely because of the encouragement of Mr Laskosz and the example of Michal and Wojtek. It was an exciting new experience for me. A year before, I didn’t even realize that it was possible for me — a fresh high school student — to read actual English literature in the original like somebody from the US or Britain. And now here I was, reading novels in English and enjoying them, to the disbelief of my parents! I quickly found out that written English was completely different from the English I would hear on TV or from native speakers. Authors would write things like “he would be forced to wipe them frequently using a stubby gloved finger” or “the final scurrying about had reached an almost unbearable frenzy”. I would encounter a lot of new words, and I had terrible problems memorizing them. I often had to look up the same word many times, which irritated me. I realized I needed a way to remember all this vocabulary. I spent thousands of hours in front of this screen. You can see I even made a DOS text-mode font with phonetic symbols. Because of all the reading and SuperMemo, my vocabulary was no longer my weakness — it was my strength. It became very hard for my teachers (non-native English speakers) to surprise me with a new word. My classmates would often ask English questions of me or Michal, because they knew they would get a better answer from us than from the teacher. I even noticed some of my teachers were getting jealous! In late 1995, I got on the Internet. Two or three times a week, after my classes, I would go to a small computer lab at the chemistry department of the local university to surf the Net. I got my own e-mail account and started writing e-mail in English. I loved to build error-free English sentences, especially with advanced vocabulary and grammar structures. However, in those early days of the Internet, my choices were limited. Almost none of my friends had e-mail accounts. Only two years later, when dial-up access became widely available in Poland, did I persuade Michal to get online and we started to write to each other in English. Around 1997, Michal and I decided to use only English to communicate. We must have spent thousands of hours talking to each other in English between school classes, attracting the puzzled looks of teachers and classmates. Speaking in English quickly became so natural that we forgot what it was like to speak Polish to each other. The decision to switch to English required some courage, but it was just what I needed at the time. I already had good vocabulary, grammar and pronunciation. What I needed was fluency — the ability to speak English on any topic, without hesitation. And it worked. In 1998, I took part in a prestigious, nationwide English competition for high school students. I was 7th in the country, out of 25,000 participants. Two years later, I easily got first place in a smaller contest for students of technical universities. With English, I can learn more about anything I’m interested in. I can read technical articles on programming. I can listen to video lectures by great thinkers. I can watch documentaries on photography. I can find better information about fixing my computer, my health problems, where to go on vacation, which products to buy, etc. It’s ridiculous how limited the Internet is for someone who doesn’t understand English. I can write for the whole world, not just the people in my country. My articles and forum posts can be helpful to the whole global community. I can communicate with virtually all educated people in the world. I have corresponded with world-class experts in science, philosophy and technical fields like software development. I get excellent entertainment that is unavailable or hard to get in Polish — e.g. Futurama, The Daily Show with Jon Stewart, The Office, Northern Exposure, funny clips on YouTube, websites like Reddit and The Onion, etc. I often wonder how much great stuff many of my Polish friends are missing. I have more fun watching movies and playing computer games. Translations are often unavailable, shortened (for time/space reasons) or incorrect. I see poor translations all the time, even on professionally produced DVDs. Whenever I’m forced to watch a movie in the Polish version, I know I am missing 5-10% of the content. I can go to any English-speaking country and communicate easily. During my trips to England and America I was taken for a native speaker many times. It felt great! I make money with English. When I graduated from high school, I translated two computer books ( Using Windows 98 and C Primer Plus ) from English into Polish. Today, I offer Polish translation services to businesses from all over the world. Subscribe by e-mail or RSS to get notified when we publish a new update.